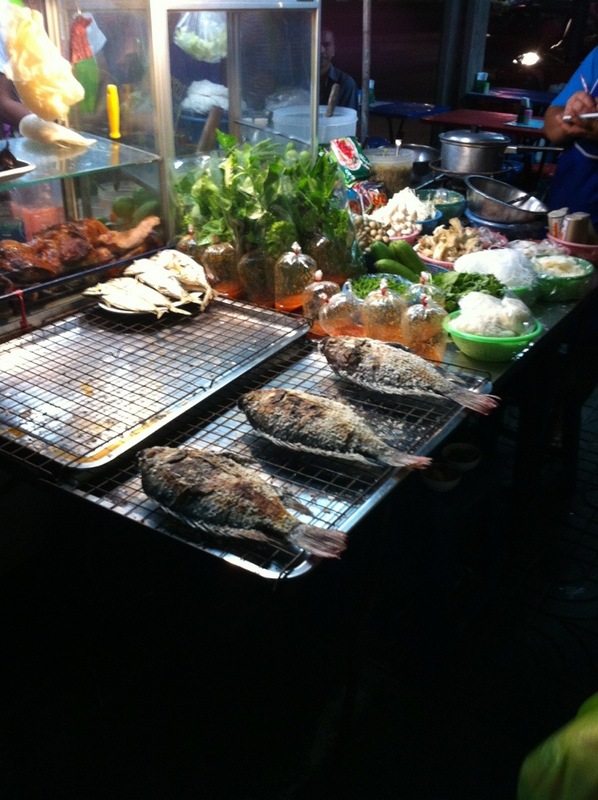 There are times you walk the streets of Bangkok and you’re overwhelmed by the sights, sounds and smells of the food. The amount and variety of food being served street side never ceases to amazing. To combat the large number of choices, I find myself picking out one or two different dishes for a brief period and constantly ordering that dish. As written, I have a long standing love affair with noodles, particular yellow noodles, served dry with red pork. While noodles are great for lunch, they’re a bit light for dinner; I’ve been searching for a ‘go to’ dish for dinner, I’ve been eating a lot of chicken and pork dishes. Tilapia, waiting for a lucky person. This photograph was taken in Ari, just under the BTS station (outbound traffic side of the street). Fish, the big one as seen in the picture, is my new found favorite. The fish is tilapia, it’s served with a whole big plate of veggies, some rice noodles and a dipping sauce; it’s amazing. Herbs are stuffed in the belly of the fish before it’s cooked, the outside of the fish is encrusted with salt to retain moisture. The fish is grilled- a good vender will be grilling the fish throughout the evening to ensure the fish is always warm and fresh. If you want to order this fish, here’s the Thai: เมี่ยงปลานิลเผาเกลือ (ชุดใหญ่-เล็ก). Suggestion- like all other street food, make sure you dine at a street side stall that is serving a lot of food and frequented by Thais. This entry was posted in Food & Restaurants and tagged Bangkok street food, thai food. Bookmark the permalink.